Never thought you’d see “Kale & Garlic Pesto Toast” in the same sentence, did you? Well, that’s just the kind of tasty surprise you can expect from us. We’re raising toast to an entirely new level of respect, giving kale a whole reason for being green, a sense of purpose to walnuts, and a place for olive oil, organic honey and freshly shaved Parmesan to throw a party your taste buds will never forget. Serve to friends, or keep it all for yourself. Pre-heat oven to 375°F (190°C). Line a baking tray with parchment paper. In a large food processor combine kale, walnuts, 3 cloves of garlic, ½ cup olive oil, lemon juice, salt, pepper and honey. Blend until smooth. In a small bowl, stir together ¼ olive oil, chili flakes and reserved garlic clove minced. Slice baguette in half, then slice each half lengthwise. Place bread quarter’s with the inside facing up and crust side down. Evenly spread chili oil over the inside of the bread followed by pesto. 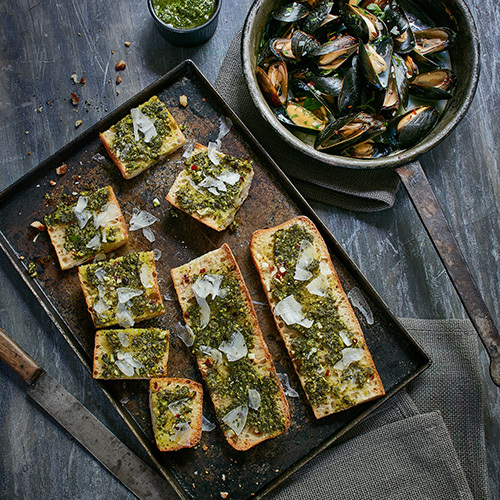 Serve bread along side your favorite mussel recipe. *Use pesto to taste, you can reserve extra pesto for later. Store in a re-sealable container in the fridge up to one week. * Try this recipe as a topping for your favorite pasta recipe.